One of America’s premiere experts on lunar missions is sounding the gong to rally the nation into going back to the Moon, before going on to Mars – and before the Chinese beat us there. 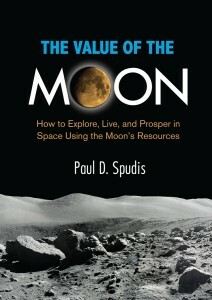 Paul Spudis, author of “The Value of the Moon,” told Forbes Magazine this week that Chinese taikonauts (the equivalent to our astronauts) will get to the Moon within five to 10 years – while the U.S. is busy trashing years of work by scrapping back-to-the-Moon efforts, such as the Constellation Program in 2010. 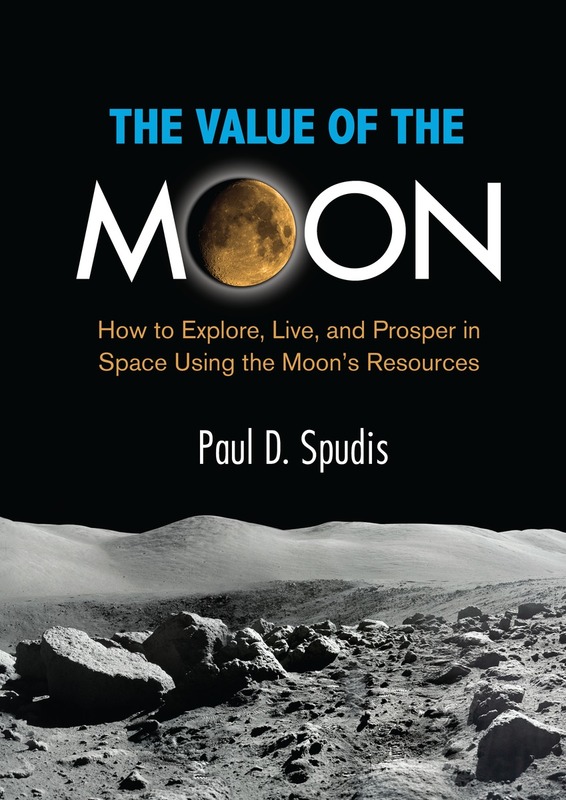 Spudis is no armchair gadfly when it comes to knowing what can be done in space, particularly in cislunar orbit and on the Moon’s surface. He makes a damn good case for setting up a base at one of the poles, where water ice can be mined in abundance and permanent sunlight can hit solar panels round the clock. The Moon’s surface composition is chock full of helium-3, which could be used to create rocket fuel and added energy sources. 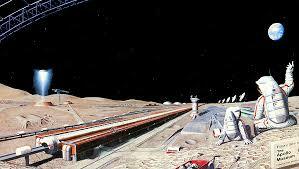 That, and perhaps a way-station between Earth’s orbit and the Moon’s, could provide an interim base for satellite repair or even refueling flights for the longer trip to Mars. 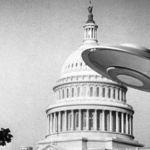 But Spudis wouldn’t be the authority he is if he didn’t take into account the nation’s useless political will, or rather, the lack of it, in any possible spacefaring scenario. 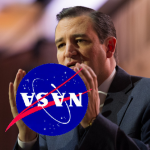 He blames politicians, lobbyists and corruption – with plenty of credit divided between Congress and the Administration – for keeping our space program in what seems a permanently stunted state. You have to admit; he’s got something there. If our politicians quit gerrymandering districts to elect Republicans, if they quit suppressing the vote for liberal blocs, if we got rid of lobbyists and “Citizen’s United,” and if our fearful leaders suddenly grew some brains, we could maybe put humans back on the Moon by 2028 and a cislunar transportation system by 2035, says Spudis. 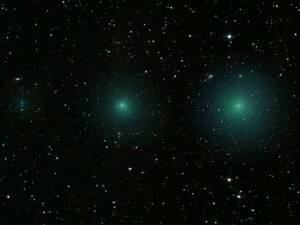 Comet 252P/ LINEAR, which made an unprecedented flyby of Earth last week (see “Raising Eyebrows”) is now expected to perform a celestial lig ht show for the Northern Hemisphere this week as the wandering snowball has become brighter than expected in the past few weeks. 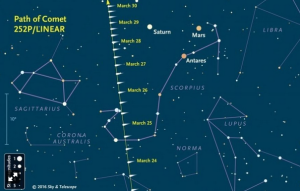 On Tuesday and Wednesday, stargazers with binoculars (or a telescope) will be able to catch a glimpse of the greenish 750-foot cosmic traveler as it appears an hour and a half before sunrise in the southern sky to the left of the planet Saturn and between the constellations Sagittarius and Scorpius. 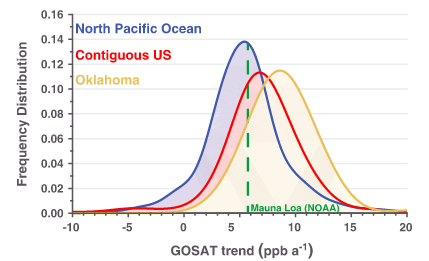 Spatial frequency distributions of methane increases from 2010 to 2014 as seen from Japan’s Greenhouse Gases Observing Satellite (GOSAT). Values are shown for the North Pacific Ocean, the state of Oklahoma, and the contiguous U.S. While carbon dioxide emissions in the US have been trending downward in the past few years, the country as a whole has been leaking methane at an unprecedented rate, according to an explosive paper released last month in the publication Geophysical Research Letters. 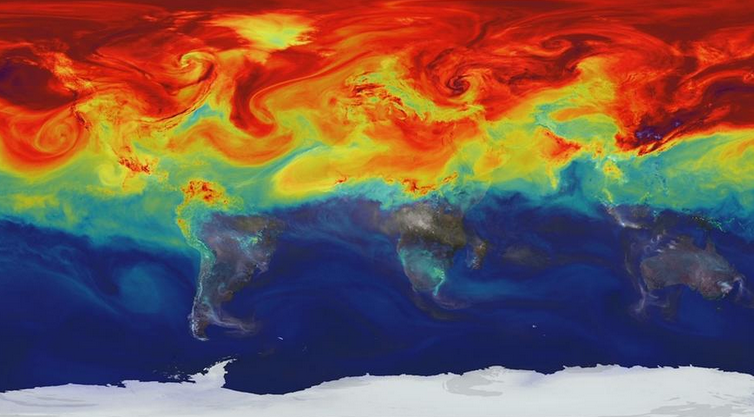 Harvard scientists using satellite data and ground measurements determined that methane pollution increased by more than 30 percent between 2002 and 2014, accounting for a 30 to 60 percent spike in the greenhouse gas saturating Earth’s entire atmosphere. In a recent must-read Nation article, America’s newly entrenched natural gas infrastructure – particularly the fracking industry – is most likely a prime culprit for the rise in this planet-killing compound that is many times more efficient in baking our planet than carbon-based pollutants. 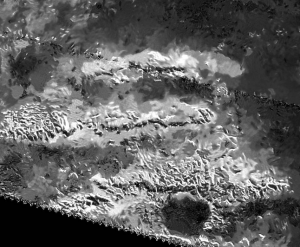 Area on Titan where highest mountain has been discovered. Speaking of smog balls, NASA’s Cassini probe has revealed that Saturn’s methane-infused moon Titan boasts mountains almost 11,000 feet high located at the planet-like orb’s equator. “As explorers, we’re motivated to find the highest or deepest places, partly because it’s exciting. 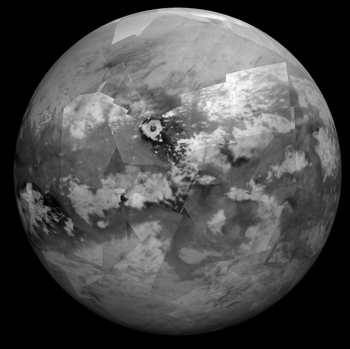 But Titan’s extremes also tell us important things about forces affecting its evolution,” said Jani Radebaugh, who is a member of Cassini’s radar team that is peering through Titan’s thick atmosphere to map the moon’s surface details. In addition to featuring liquid methane lakes, rivers, and “rain” cycles, Saturn’s largest moon is believed to have an icy crust that is floating above an ocean of water much like the Earth’s outer shell surfs our planet’s molten mantel, causing geographic formations such as mountain ranges, canyons, coastlines, etc. Cassini’s radar instrument unveils the mountainous terrain at Titan’s equator. 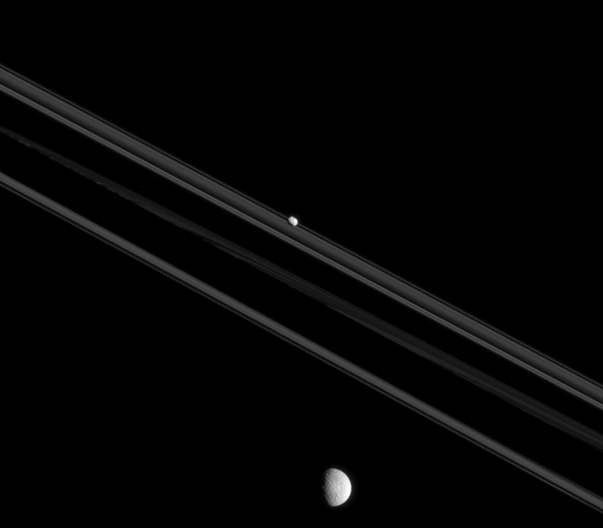 Saturn inner moons Mimus and Pandora orbit near the gas giant’s rings. On a related note, a just-published paper suggests that some of Titan’s smaller siblings may have been birthed as recently as 100 million years ago at a time when dinosaurs were already populating the Earth. 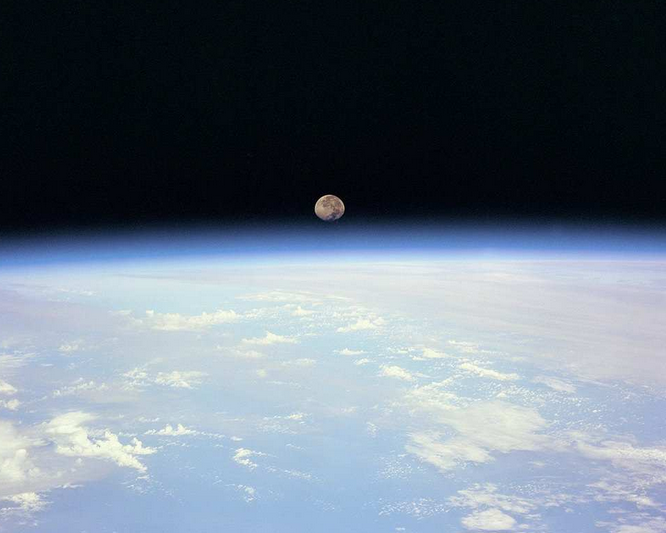 (In contrast, Earth’s moon is thought to have been formed less than than 100 million years after the Solar System fused some 4.5 billion years ago.) This eyebrow-raising theory was released last week in the Astrophysical Journal by researchers who believe some of Saturn’s inner moons could only have traveled in their relatively pristine orbits for a short period, since gravitational forces caused by orbital resonances interferes with the movement of celestial bodies. “I think we are at a point where we can confidently say that the inner moons are not as old as the planet,” Matija Ćuk, lead author of the new research paper, said in an interview with Ars Techica. Saturn has the busiest planetary system in the Solar System with a tangled network of at least 62 moons. 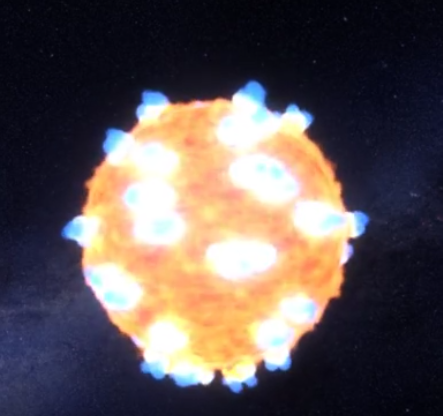 NASA’s intrepid Kepler space telescope has added a new feather in its cap with visual pix of the initial shock wave flash of two massive suns exploding into supernovae. A search by an international team of astrophysicists analyzing light from 500 galaxies and 50 trillion stars captured by Kepler over a 3 year period yielded two red supergiants exploding in Kepler’s gaze. 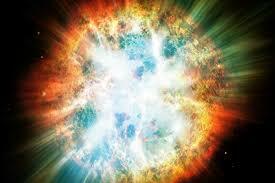 Both “shock breakouts” occurred in 2011, the first coming from colossus KSN 2011a at nearly 300 times the size of our Sun and 700 million light years from Earth. 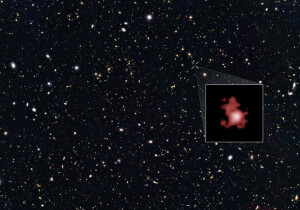 and the second, KSN 2011d, which is approximately 500 times the size of our sun and about 1.2 billion light years away. D a n g e r o u s N e i g h b o r ? 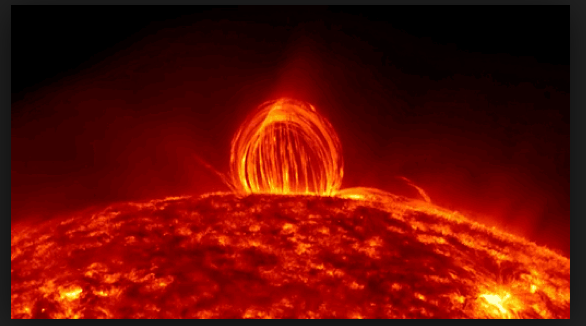 Speaking of blasts, a team of researchers in Denmark have studied whether our Sun could produce deadly “superflares,” and came the the conclusion that while the likelihood is small, it’s not impossible. 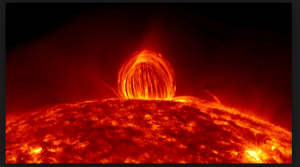 Typical solar flares, which occur when large magnetic fields on the surface of the Sun collapse and can cause communication disruptions as well as damage to electronic networks on Earth, appear to be generated by the same processes as super bursts produced by other stars. 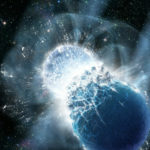 However, the magnetic fields on the exterior of stars with super eruptions are generally 10 times stronger than those on our Sun, reports Christoffer Karoff of Denmark’s Aarhus University who’s team employed the new Guo Shou Jing Telescope in China to study the magnetic fields of almost 100,000 stars, some of which are capable of producing solar eruptions10,000 times more powerful than the most destructive recorded flare that hit the Earth in 1859. To illustrate how much our Sun can light up a planet, a doctoral candidate at the University College London has reported that a huge solar storm in 2011 caused Jupiter’s X-ray aurora to burn eight times brighter, and generate energy hundreds of times greater than Earth’s northern lights. 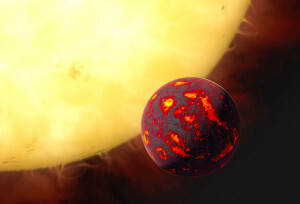 Using NASA’s Chandra X-ray Observatory, the scientific team led by William Dunn hopes this discovery “will help explain how space weather is driven by the solar wind interacting with Earth’s magnetosphere”, says the study’s co-author, astrophysicist Graziella Branduardi-Raymont. 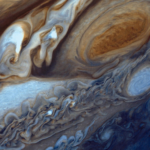 “New insights into how Jupiter’s atmosphere is influenced by the Sun will help us characterize the atmospheres of exoplanets, giving us clues about whether a planet is likely to support life as we know it,” he added. Virgin Galactic’s original grand plans for lofting cosmic jet-setters into space are back on track, says the company’s CEO George Whitesides, who reported last week that bookings from sub-orbital day-tripping hopefuls have almost bounced back to the level seen before the fatal breakup of its SpaceShipTwo rocket plane in October 2014. Up until the red carpet unveiling of its new “Unity” spaceliner last month, many of us thought Virgin was going to pull out of the space tourism race altogether. 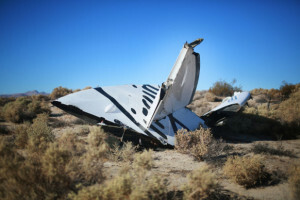 Virgin Galactic crash scene in 2014. 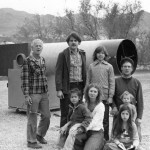 For more than a year the company, which generated an avalanche of hoopla about its plan to loft celebrities and other rich idiots considerably short of low-Earth orbit before the tragic accident that killed its test pilot Michael Alsbury, was curiously moot and even evasive when reporters asked about the tourism program. 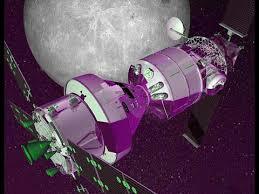 Many presumed the company, from its silence and actions, was going to instead focus on private satellite launches. 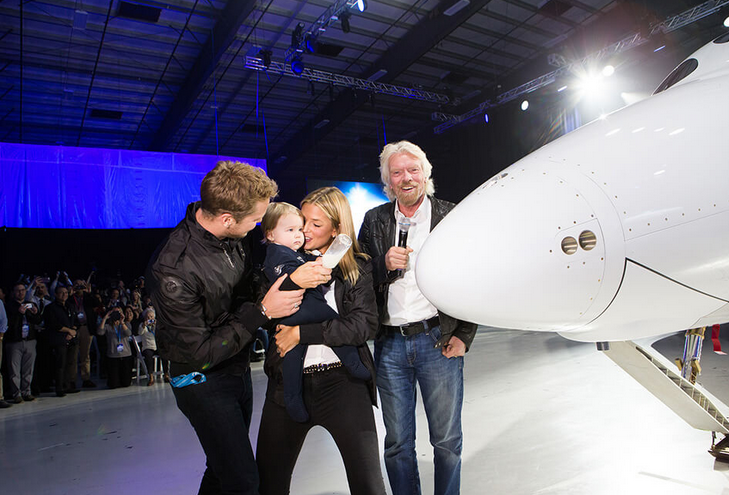 Richard Branson’s grandchild christens Virgin Galactic’s new Unity spaceliner with a milk bottle at PR bash last month. Now Virgin Galactic is hoisting its space tourist flag again, especially in light of SpaceX grabbing recent headlines with their barge launches and satellite deployments. Whitesides asserts that only 25 of the 700 fee-paying clients on the space ride list dropped out after the accident in 2014, but others following the travails and triumphs of the company have implied that many more than that bowed out. Regardless of the actual numbers, Richard Branson, seems confident of success, especially with the money spent on his company’s updated “Unity” suborbital bus, which is undergoing ground tests and is thought to be ready for its first trial flight soon. 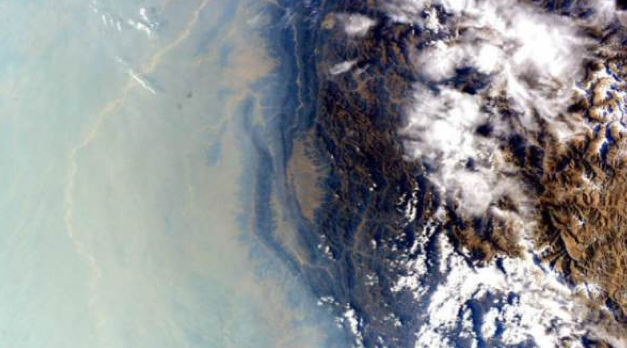 Potential view from Virgin Galactic flight. At $250,000 per seat, space-goers will be lofted to a point beyond the “Kármán line” (62 miles/100 kilometers above Earth), get to unbuckle their seatbelts for a few minutes to float around the pressurized cabin, look out the portals to view Earth, and then buckle back in and go back through the atmosphere and land on terra firma. Among the talentless elite who are on the waiting list are crooner Katy Perry and blond person Paris Hilton. Other, more thoughtful luminaries include Stephen Hawking and Tom Hanks. Chalk one up for the record books, as two comets will be zipping by Earth today and tomorrow, with the second one on Tuesday flying closer to the our planet than all but two comets in documented history. Despite the near-Earth fly-by, these celestial visitors — greenish orbs named 252P/LINEAR and comet P/2016 BA14 – sadly won’t be visible to the naked human eye says NASA’s newly-forged Planetary Defense Office. 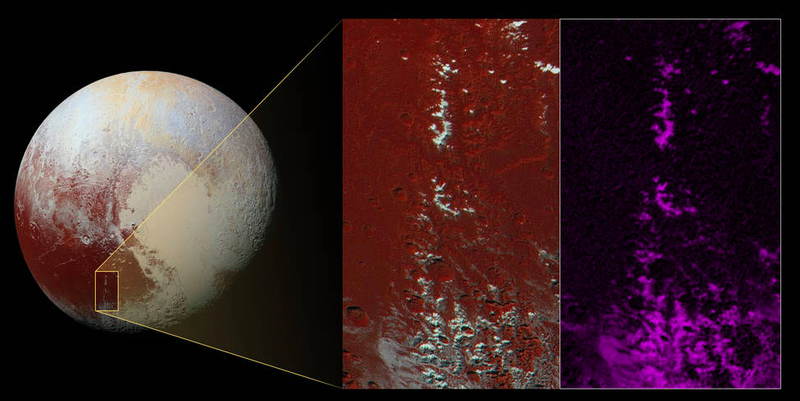 And while their designated names don’t exactly flow off the tongue, NASA says that “LINEAR” is about 750 feet across in size, with its “calved” companion P/2016 BA14 about half that length. 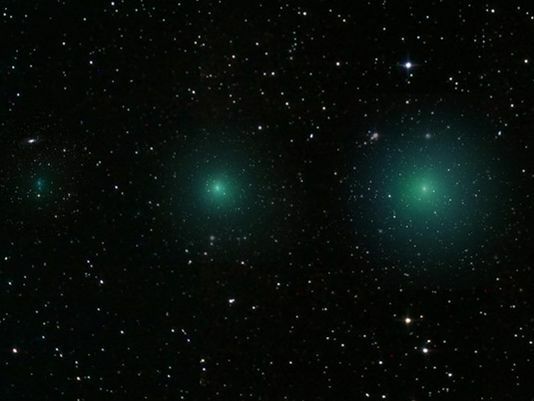 The larger of the two comets to buzz by Earth will fly 3.3 million miles today (on left), while the smaller BA14 (right) will come within 2.1 million miles from Earth tomorrow. They are following one another in very similar orbits, and when NASA discovered a slight tail on the skinnier second one, they realized it wasn’t a garden-variety asteroid as originally thought, but more probably part of the original one ahead of it. 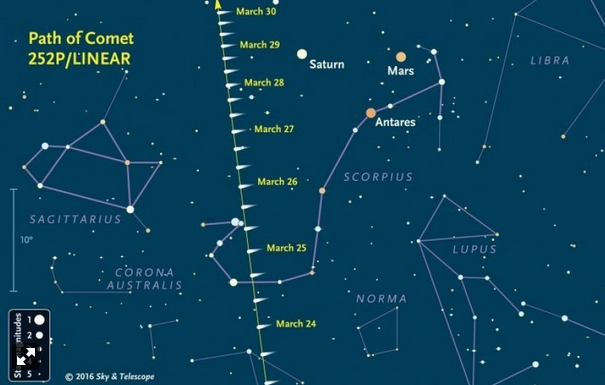 The best way to view it is to go to The Virtual Telescope website, which will broadcast a live telescopic image of the comets’ historic encounter on March 21st and 22nd starting at 21 UT (4 p.m. CDT). Sky & Telescope will also keep you updated with news, photos, and maps of both comets in the coming weeks. Hold on to your tin foil hats. 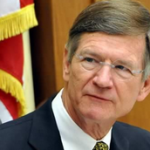 No, it’s not a new story about how Congressman Lamar Smith (R-seceded Texas) is calling NASA’s Earth monitoring program a liberal cabal. 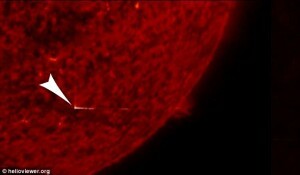 UFO hunters have found an alien portal on the Sun. Naturally, infamous UFOer Scott C. Waring of “UFO Sightings Daily” picked up that pigskin and ran to the goal line with it. It also, cites Waring, proves that the Hollow Sun Theory has been real for millions of years. The satellite photo proves it. The staff of Galactic Sandbox is begging: Someone please tell us this is not happening. 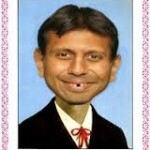 Where is the Great Spaghetti Monster when we need Him, er It? Researchers operating the La Silla Observatory in Chile have taken a major step toward determining the cause of mysterious lights on the dwarf planet Ceres that were photographed with unprecedented clarity last year by NASA’s Dawn spacecraft. Spectrograhic measurements taken by the earthbound ESO 3.6-meter telescope show unexpected variations in the bright spots located inside the body’s Occator crater, suggesting that the source material is volatile and evaporates in sunlight as the planetoid rotates every nine hours. European Southern Observatory scientists are still scratching their heads over the identity of the reflective substance, but theorize that it forms plumes that evaporate quickly in the sunlight, thus producing the observed random patterns. 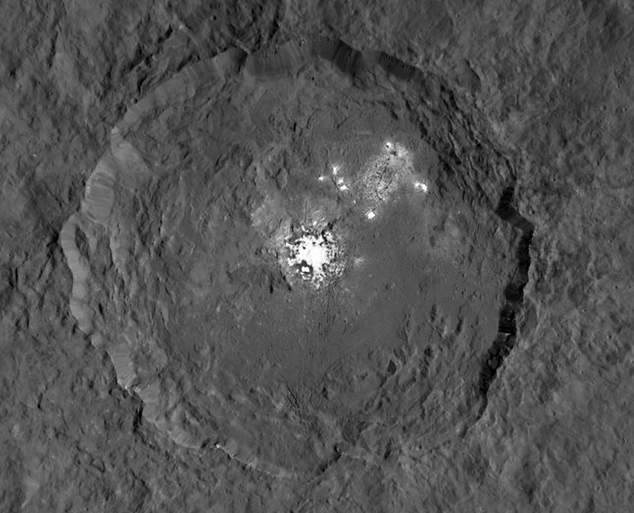 Ceres is known to be water rich, however researchers haven’t ruled out other culprits, nor have they determined the energy source responsible the for the continual reflective leakage. 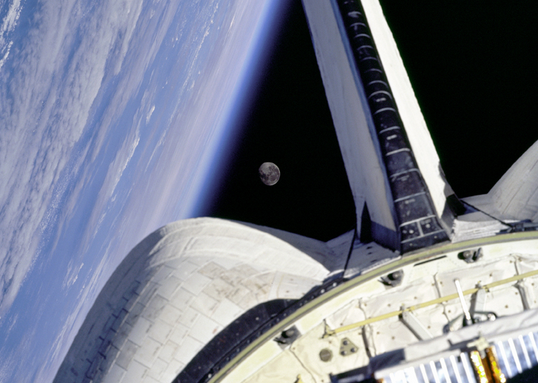 With all its spaceflight expertise logged over the past few decades, NASA thankfully has had very little experience with how potential fires can spread aboard a spacecraft in zero gravity. In order to close this knowledge gap, the space agency will conduct a controlled burn aboard a Cygnus cargo craft after itl delivers supplies and science experiments to the International Space Station on Tuesday. Once the Orbital ATK-built transport is emptied of its supplies in the next couple of months, it will be filled with ISS trash, cast adrift, and set ablaze with specially-made material developed for the test. According to Orbital ATK, the results from the first of three Saffire payload experiments, including flame growth and oxygen use measurements. 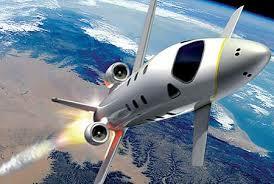 will be beamed to Earth before the craft reenters the atmosphere over the Pacific Ocean. NASA’s Hubble Space Telescope continues to earn its keep with the discovery of nine gargantuan stars with masses 100 times greater than our Sun. (While enormous, these powerhouses still don’t come close to taking out R136a1, the current heavyweight champ of the universe, which tips the scales at more than 250 solar masses.) 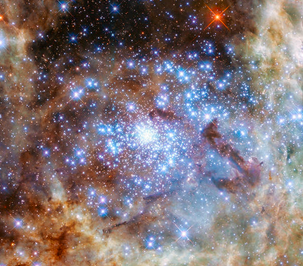 The detected nonet of stars, located 170,000 light years away in the cosmically-tiny Tarantula Nebula, are not only huge, but also extremely bright. Together these nine stars outshine our sun by a factor of 30 million. Anyone reading this publication knows that the human race – in order to survive this Universe – must abandon Earth and find a new home somewhere “out there” within a billion years as the Sun’s luminosity dims and can no longer support life as we know it (not to mention the weenie roast that happens another 4 billion years later when our local hydrogen bonfire gets serious about toasting the inner half of this solar system, and then dies). Yet, we are so reluctant to take into account our own torrid poisonings upon this Earth: I refer to the fact that our days of living on this planet are cut quite short from the “next billion year” mark. This is a fact confirmed by 97 percent of the world’s scientists (the other 3 percent, more concerned about their boat payments, have been bought out by massive corporate polluters like the Koch brothers). 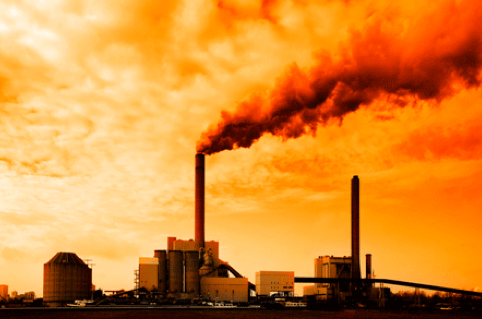 NOAA reported last week that the growth rate of carbon dioxide in the atmosphere in 2015 was the greatest in a single year ever..
Dishearteningly, recently published research shows that we are killing ourselves much faster than we previously thought. With that in mind, I applaud President Obama for leading the way in the Paris “Climate Crisis” Accords that took place last November. For the first time in Earth’s history, the world’s leading nations agreed to take meaningful action towards curbing the green house gasses we are spewing into the atmosphere. In short, we are attempting to buy more time to get the hell off this planet. And this international agreement, made in the aftermath of obscene and moronic terrorist attacks, was unanimous. For once, it was looking like our world leaders reflected the will of the people they represent. However, not to be whupped by representative democracy, the multinational corporate hydra shook its collective smoke-ringed heads and sputtered, “not so fast.” As if on cue, the US Supreme Court in response to the imploring of 27 states and dozens of corporations and industry groups seeking to block the E.P.A, issued an unprecedented stay of the Obama administration’s Clean Power Plan, thus melting the hopes of a climate change U-turn faster than a polar bear-ensconced glacier shard. Technically, the Supreme Court placed a temporary stop to the EPA enforcing the new rules until the justices themselves decide their legality. Sadly, with pro-corporate, anti-planet stalwarts like Justice Antonin Scalia on the bench, the future was looking pretty bleak. And then, who woulda thunk?? To paraphrase Antonio Salierii, “A miracle happened” – Scalia up and dies. Sorry folks, but I gotta say, not a day too soon. 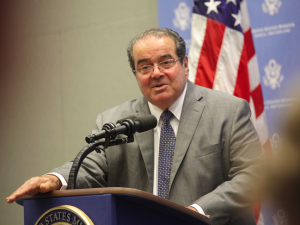 Just before he passed, we climate-is-screwed knowers also knew that Scalia’s vote in this matter could undo the international agreement… and if the U.S. reneges on it, what do you think China and India and the USSR and the entire world will do? Oh Dear Flying Spaghetti Monster. Take me now. When I take into account what I have researched and investigated, what I know right now when it comes to the Republicans who are trying to halt any effort to save the human race from itself, their overt efforts are bereft of any reality. Everything is for show. The Republican Party’s presidential candidates deny global warming and mock scientists for studying Earth’s accelerating warmth, much like Senator Ted Cruz (R-Canada) and Congressman Lamar Smith (R-Seceded Texas) does in his steering of the House Space, Science and Tech Committee which ultimately funds (or defunds) NASA. 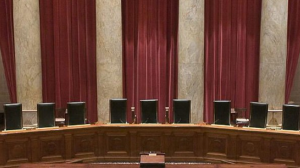 And then these Republican proxies for Polluters-R-Us go running home to mommy, er I mean the Supreme Court, when their fairy tale (and ultimately mercenary) views don’t prevail. The eventual point I wanted to make is that we now have a chance to perhaps pull the Earth back from the brink of a disastrous human-caused early demise, now that there is a seat vacant on the Supreme Court. 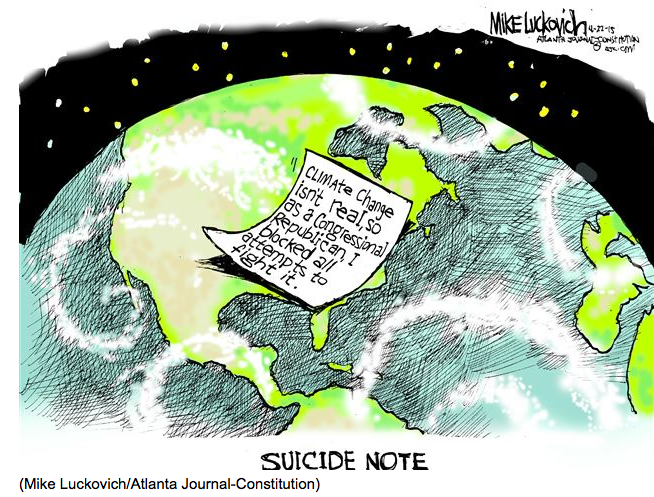 And any unconstitutional chant by a walking dead Republican for Obama to “do nothing” and let the next President pick a Justice nominee should be seen for what it is — a last ditch attempt to put a bullet to the head of Mother Earth and its inhabitants. Keep tuning in here, folks. We will give you a heads up when the Republicans greed goes so over the top that we all have to scram away from any nuclear or environmental bomb they toss when they don’t get their money-lusted way. 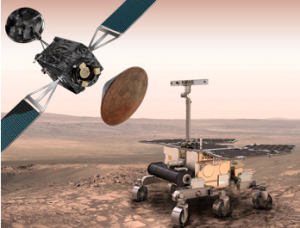 As of publication Sunday, planetary scientists hoping to find past or present evidence of life on the Red Planet were crossing their fingers, as the first phase of the European Space Agency’s long-awaited ExoMars mission was poised for launch today aboard a Russian Proton rocket. In preparation of a rover mission that will depart Earth in 2018, today’s liftoff from the Baikonur cosmodrome in Kazakhstan will carry ESA’s Trace Gas Orbiter (TGO), designed to search for atmospheric trace gasses such as methane, and an Entry, Descent and Landing Demonstrator Module (EDM – also known as Schiaparell) that will evaluate the future lander’s performance as it plunges to the planet’s surface, as well as monitor the environment at the rover’s planned landing site. The duo spacecraft are expected to arrive at Mars this October. 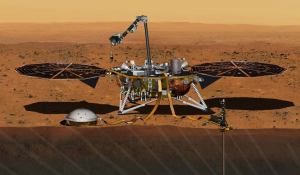 NASA’s Interior Exploration using Seismic Investigations, Geodesy and Heat Transport (InSight) mission, which was originally slated to be launched this month but was sidelined with a pesky vacuum leak to its prime instrument last December, has been assigned a new launch window that starts May 5, 2018 (that’s right, this is not a typo), with a Mars landing set for November 26 later that year. Once the InSight craft reaches its destination, it will burrow deep in the Red Planet’s interior to help scientists better understand how rocky members of our Solar System, including Earth, formed and evolved. The seismometer device that failed last year will be retooled by NASA JPL and reintegrated and tested by France’s CNES space agency, with a finished, thoroughly tested component ready by 2017. According to NASA, the main sensors need to work within a vacuum chamber to provide ground movement measurements at incredibly accurate levels of half the radius of a hydrogen atom, while being tough enough to maintain a high degree of rarefaction around the sensors through the rough and tumble pressures of launch, landing, deployment, and a planned two-year stint on Mars’ surface. Just think of the change you can save with recycled rockets, Space X’s President Gwynne Shotwell (no pun intended) implored a group of satellite industry professionals as she pitched her company’s aggressive plans to offer discounted payload rides atop spacecraft powered by recovered first stage boosters. “We need to recover more and see how many times we can reuse the stage … but I’d like to see a 30 percent reduction from reuse,” she told attendees at the Satellite 2016 love fest in Maryland last week. “The second stage we are not currently recovering, maybe we could figure out some great way to get that back as well,” she added. 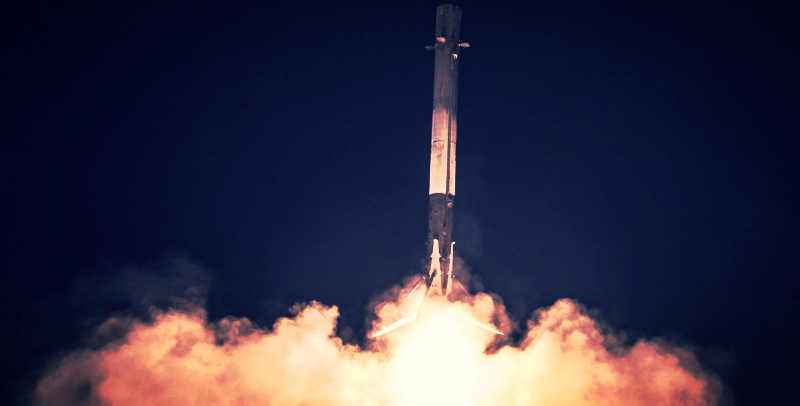 With plans to loft 18 rockets this year – including one with a reclaimed first stage – keeping costs down will be crucial to Space X as it navigates the cutthroat commercial satellite delivery industry. 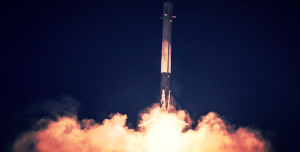 According to Via Satellite, Shotwell dispelled any notion that every Falcon-9 first stage will be salvaged, noting that the company hopes to collect 75 to 80 percent of the primary boosters from low Earth orbit missions and 50 to 60 percent used in Geostationary Orbit deliveries. On a related subject, Shatwel also disclosed that to accommodate its ambitious 30 to 50 percent increase in the number of missions year after year, Space X will be employing an additional launchpad at Cape Canaveral, and has plans to build a new launch center in Houston TX. 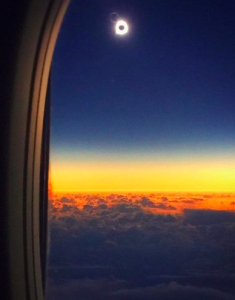 Of the many stories surrounding last week’s Total Solar Eclipse, one l iterally high drama 30,000 feet about the Pacific occurred as a dozen astronomers and eclipse chasers convinced Alaska Airlines to make an adjustment to its flight 870 from Anchorage to Honolulu to zip straight through the eclipse’s totality. 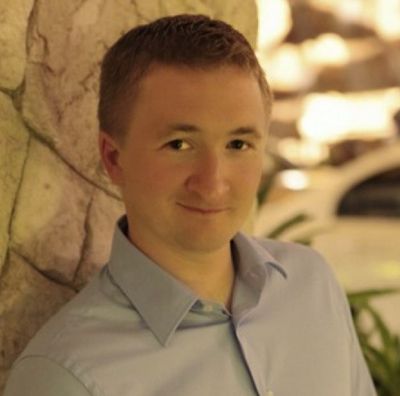 According to USA Today, Chase Craig, Alaska Airline’s director of onboard brand experience, said via Alaska Airlines’ blog: “We recognize our customers’ passions. Certainly we can’t change flight plans for every interest, but this was a special moment, so we thought it was worth it. Now we have a plane full of customers who will be treated to a special occurrence. 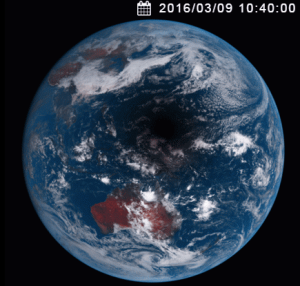 Related Solar Eclipse hoopla: From a slightly higher altitude, Japan’s Sunflower-8 meteorological satellite captured the Moon’s shadow from Earth as it raced across the Pacific on March 9th. To view the complete video, click here. Cosmologists from around the globe pricked up their ears recently after astronomers from Cornell University detected repeating bursts of radio waves for the first time, coming from someplace far – very far – outside our galaxy. As expected, the old-fashioned, true believing tin foil hatters are howling from the rooftops, convinced it is aliens making the belching blasts. But even if it isn’t E.T. sending us their howdy do, it’s a fantastic discovery. 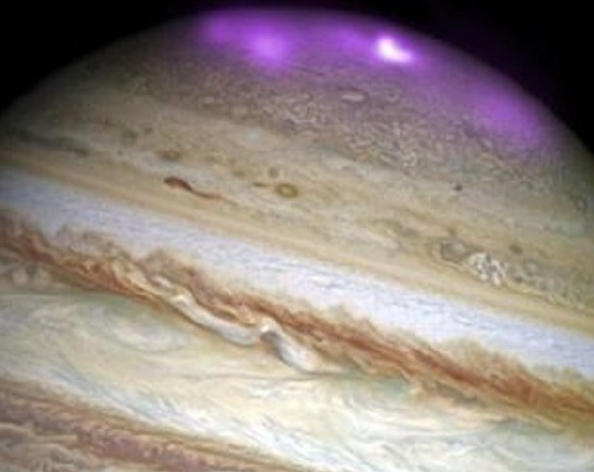 Never before have scientists found these flares hiccuping from the same source. In fact, only about two dozen “Fast Radio Bursts” (FRB) have been detected since 2007, and astronomers believed, until now, that they had to be coming from a collapsing or emerging black hole, stars colliding, or a supernova – in short, from an event that kablooeyed itself into cosmic vapor. 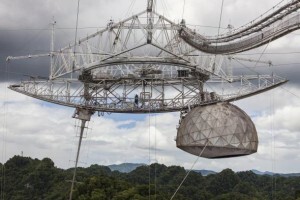 Arecibo Radio Telescope in Puerto Rico. First detected in 2012 by Max Planck post-doc Laura Spitler, the “Spitler burst” was picked up by the Arecibo Radio Telescope in Puerto Rico. 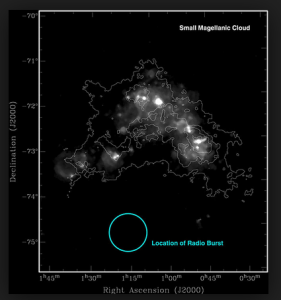 According to Spitler, the mysterious radio emissions lasted only a thousandth of a second, and these particular discharging bursts remarkably emanated from the same entity 6 billion light years away. After scratching their heads in disbelief, the astronomer and her colleagues looked at the signals again, however they saw nothing in the data. They finally tried wrangling a blast again one last time in mid-2015, believing they would get nothing since whatever caused the FRBs must have blown itself to smithereens. FRBs are coming from a point in the sky near the Small Magellan Cloud dwarf galaxy, itself a source of X-ray energy. The data and print-outs from the 2015 viewing were not analyzed fully until months later, and the Cornell team got the surprise of their lives: the same “object” produced 10 more of the FRBs. Six of them were produced within 10 minutes, while the others were separated by weeks. 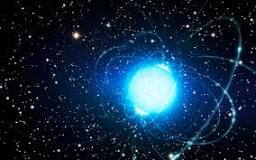 Right now, the Cornell astronomers’ best guess is that the repeating FRBs are coming from a magnetar, which is a neutron star with a super powerful magnetic field. They emit high-energy electromagnetic radiation, particularly X-rays and gamma rays. 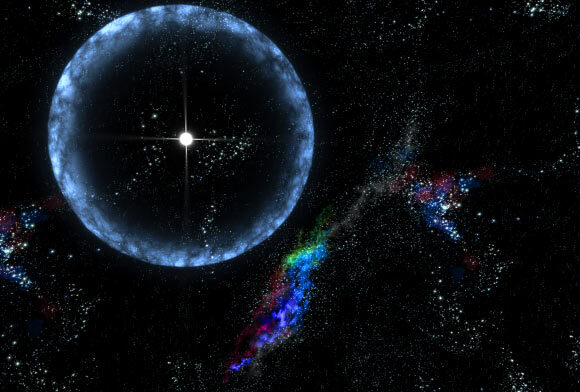 Ultimately, the Cornell gang put out the idea that there could be two different species of FRB’s: the kind that come alone when its source blows itself up, like colliding stars or other catastrophic events, and the kind that get repeated. 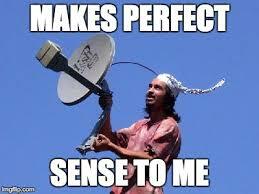 A magnetar? Even the Cornell brainiacs (let alone the tin foil hatters) can’t say for sure. While NASA is keeping the lid on most details of orbital marathoner Scott Kelly’s condition following his return from space last week, one detail that received a special shout through the national media megaphone was that he grew 1.5 inches (albeit temporary) during his 340-day stay aboard the International Space Station. 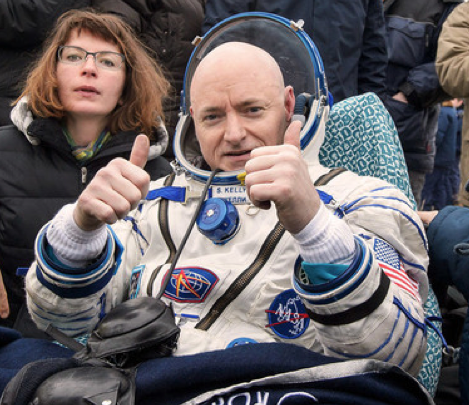 In addition to experiencing an almost immediate collapse of the natural spinal stretch achieved in zero gravity, Kelly reported after his return to Earth sore muscles, joint pain, over-sensitive skin and a sense he had been away for more than a year, according to Reuters. Kelly’s nearly year-long endurance spaceflight included more than 450 experiments, and is expected to further researchers knowledge on the effects of humans on eventual treks to Mars and other points beyond. As was the case of most other space travelers, Kelly noted the fragility of our home planet’s ecosystem, especially in light of humankind’s desecrating presence: “You can see a lot of pollution over parts of Asia that is almost continuous. You can’t really see the ground very well. And those fires in California over the summer, that smoke was pretty extensive. 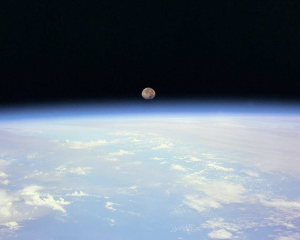 But the predominant thing is you just notice how thin the atmosphere is, how fragile it looks. That combined with these large swabs of pollution is somewhat alarming,” Kelly said in a NASA Johnson news conference..
After several halted attempts, Space X finally succeeded in launching its Falcon-9 rocket on Friday, and while it scored a touchdown in delivering Luxomborg’s SES-9 communications bird into orbit, the commercial space firm failed to nail the extra point with achieving a pinpoint landing atop a special barge floating 375 miles off the coast of Florida. 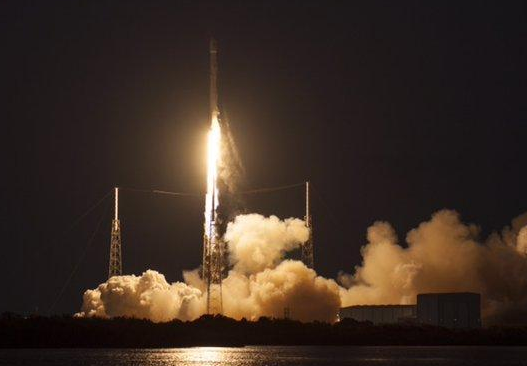 “Rocket landed hard on the droneship. 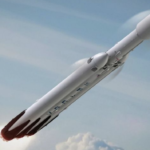 Didn’t expect this one to work (v hot reentry), but next flight has a good chance,” Space X chief Elon Musk tweeted optimistically, according to a UPI report. The Hawthorne California-based firm cautioned before the flight that there were low expectations of safely landing the Falcon’s first stage because of the additional fuel needed to loft the SES satellite. 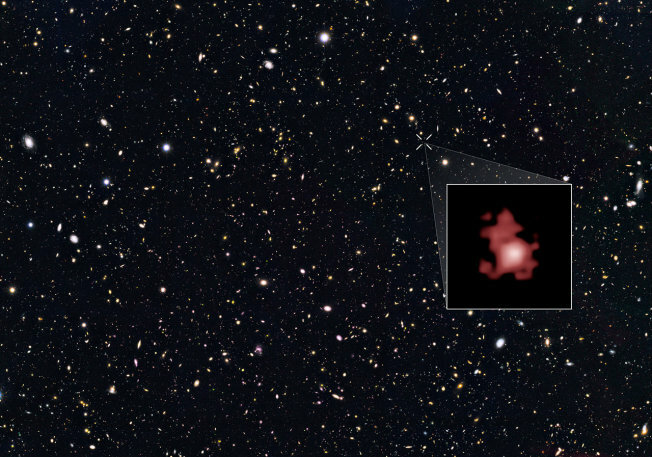 The Hubble Space Telescope has set a cosmic record into the distant past, snapping pix of a galaxy as it was first forming in our Universe a mere 400 million years after the Big Bang some 13.8 billion years ago. The galaxy, dubbed GN-z11 (and don’t ask us how it got this goofy moniker) is 25 times smaller than the Milky Way but the stars in it are forming 20 times faster than more common era galaxies. Scientists determined how far away and how old the galaxy was by using red shift wavelength in our expanding Universe. 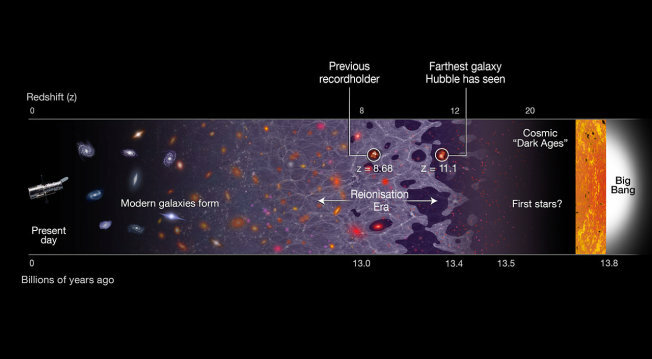 Knowing how extremely far back in time and space GN-z11 is, astronomers have high hopes that the even more advanced James Webb Telescope, which is due to launch a million miles into space in October 2018, will catch the actual birth of the Cosmos. That said, scientists are not even close to knowing how many billions of times the Big Bang might have happened, or how many katrillion other universes there are besides our own. No, he wasn’t bitten by a radioactive spider or rocketed to Earth as an infant from Krypton, but UC Berkeley astronomer and exoplanet egghead Howard Isaacson added crime fighting to his resume when he recently assisted police in the arrest two burglars on the university’s campus. Isaacson, who studies alien planetary systems for NASA’s Kepler Space Mission, used his trained eagle eyes in spotting suspicious activity late one night from his lonely post that led to the arrest of two intruders accused of stealing items from the building that houses Berkeley’s astronomy department, thus ending a crime spree that allegedly involved other break-ins at UC Irvine in southern California.